Burger King says its new Nightmare King sandwich is "clinically proven to induce nightmares." It's Halloween time, which means that some fast food chains are getting in on the holiday fun with ghoulish new menu items. Burger King is leading the charge this year, having already debuted their Scary Black Cherry slushies that turn your mouth black and wreak havoc in the restroom. As it turns out, they were just getting started, as proven by their new Nightmare King, which makes its debut on Monday, October 22nd. Turning your mouth black and raising your cholesterol just isn't enough for Burger King. 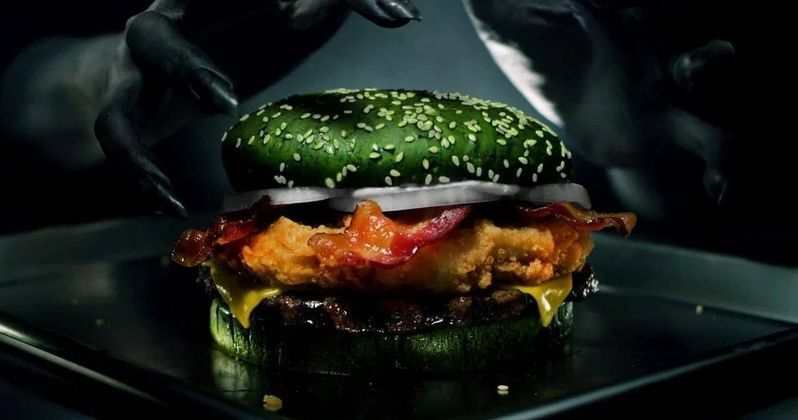 That's why they've introduced the Nightmare King, a sandwich that boasts a quarter pound of flame-grilled beef, a white meat crispy chicken fillet, melted American cheese, thick-cut bacon, creamy mayonnaise, and onions on a glazed green sesame seed bun. They've ditched the black bun to go full on spooky with the green version. But that's not all. The fast food chain claims that the ghoulish sandwich will give you nightmares. Burger King conducted a sleep study with 100 participants over 10 days on people who ate the Nightmare King before going to bed. According to scientists, four percent of the normal population experiences nightmares during the night. Burger King's study suggests that their sandwich made the incidence of nightmares "increase by 3.5 times." Eating any kind of food right before bedtime isn't exactly the best thing for humans to do anyway, but eating a sandwich with both fried chicken and burger in it, is probably enough to give anybody nightmare, even without the gimmicky green bun. The Nightmare King will be on sale from October 22nd until November 1st. As it turns out, in other scientific studies, people who eat fast food generally have a hard time even remembering their dreams. There has not been a successful study that pairs nightmares and fast food together. A 2007 study even indicated that people who eat fast food have less nightmares, but this may because they're not remembering their dreams anyway. With that being said, Burger King is ready to try and give its patrons nightmares after ingesting their food. The Nightmare King and the Scary Black Cherry slushies might be able to do the trick, if taken down at the same time. It's going to take a lot more than a green bun to give Burger King patrons nightmares, so for now, the company will keep trying until they have reached the perfect combination. It should be noted that the sandwich is not currently available yet, so it could very well end up giving one nightmares if even right before bed. It sounds like more of a challenge than anything. If you're into that kind of thing, you can head over to Burger King to see if you live near a participating restaurant that will take part in the Nightmare King Sandwich.